Albion have to get back to being hard to score against as their promotion push heads into a crunch period. The Seagulls kept 14 clean sheets in their opening 23 games, heading into Christmas. Since then, they have let in a number of soft goals and kept just one clean sheet in eight league games, conceding 12 goals – three to both Huddersfield and Brentford and two to Preston. Back-to-back home games with Burton Albion and Ipswich were viewed by a number of fans as a chance to get the promotion push, which had stalled slightly, back on track. The 4-1 win against Burton helped lift confidence around the Amex but the 1-1 draw with Ipswich was a frustrating evening for players and fans alike. In both games, Albion conceded to set-pieces. Michael Kightly’s superb free kick was pretty much unstoppable on Saturday, although Brighton manager Chris Hughton will look at the build-up to the set-piece being awarded and what could have been done better. Ipswich’s goal on Tuesday was sloppy from a Brighton viewpoint, with Luke Chambers left unmarked to bravely head home a lovely delivery from Tom Lawrence. Hughton was disappointed with those goals and said afterwards: “We conceded from a set-play on Saturday, although it was a game we won, and we conceded from another set play today. A trip to in-form Barnsley on Saturday will not be easy before Albion entertain fellow promotion-chasers Reading and Newcastle in quick succession. They have to get back to being hard to score against to return a decent points return. 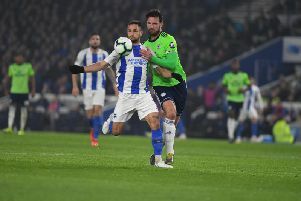 There have been changes to the defence in the past few games, with Lewis Dunk and Bruno missing matches and left-back Gaetan Bong being out for the past eight games – although Sebastien Pocognoli hasn’t done badly in his place. Albion still have the second-best defensive record in the Championship, to Newcastle, with only 26 goals conceded in 31 matches, but they have had keeper David Stockdale to thank for three penalty saves already this year. Every team goes through a blip in a season and Albion are still in a strong position in the league, four points ahead of third-placed Huddersfield, who have won ten of their past 12 league matches. There’s no doubt Brighton are in good hands with Hughton as manager and he will remain calm in the pursuit of promotion. Talking about the Seagulls’ run of one win in four, he said: “It’s incredibly difficult to go through a season without having difficult periods. “There are going to be difficult games in a season and there are going to be diffcult periods. The sooner Albion get back to being hard to score against, the quicker they will get out of their difficult period.